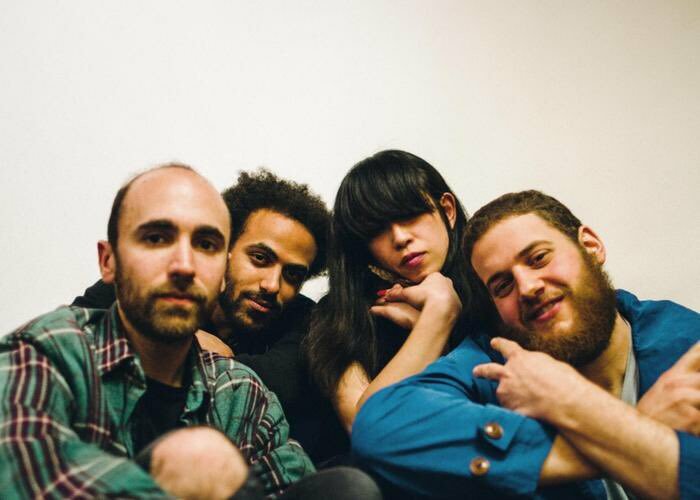 Yuck have an important place in 2010s indie, but probably not the one they’d like. Their sound is heavily influenced by 90s alt-rock giants like Sonic Youth, Pavement and Dinosaur Jr., and their eponymous debut album was a pastiche – albeit an extremely catchy an enjoyable one – of those styles, and wasn’t really anything new. Although it was extremely popular in underground circles and treated favourably by indie music publications, its true unwitting purpose was arguably to act as a bridge for younger listeners to discover the originators of a fuzzy, lo-fi, alt-punky sound. After the departure of frontman Daniel Blumberg, the band soldiered on with the comparatively mediocre Glow and Behold, which frankly recycled a lot of ideas from Yuck, and then delivered more of the same with this year’s much-hyped but unfortunately quite dull Stranger Things. They have a great reputation for live gigs, though, and the Sauchiehall Street basement venue fills up progressively as the two support bands play their sets. The Van T’s – a new-ish local band whose star is quickly on the rise – open the night with half an hour of high energy surf-pop, definitely winning themselves some new fans in the process. Then, for better or worse, Berlin-based quartet Soda Fabric steal the show with a driving and impressive Neu!-esque opener, before populating the rest of their set with some shimmering, catchy indie pop – definitely a band to watch out for. Yuck enter from stage left with little fanfare, and launch straight into ‘Cannonball’, the latest single from Stranger Things. The fuzzed-out guitar tones are instantly recognisable, but Max Bloom’s vocals are far too high in the mix, piercing painfully through the noise – it doesn’t really help that he seems fairly disinterested in the gig: he stands stock-still for most of each song, and his crowd interaction is standard, rehearsed and obvious. It’s a real shame. Bassist Mariko Doi takes to the mic for the first time during ‘Lose My Breath’, and ‘Get Away’ comes surprisingly early in the set, the band perhaps wanting to get their 2011 magnum opus out of the way as soon as possible. The real problem with this set is the songs. There are so many mid-tempo, forgettable tunes that just plod along on their last two albums that it’s difficult to enjoy them after the first chorus has finished. It’s well known that they tend to look reasonably aloof and impassive on stage, but Doi looks positively bored and the bigger riffs are run through robotically. It’s really hard to feel anything during this set, even for someone who feel in love with their debut record all those years ago and has been waiting to see them for that long. Anyway, keep an eye out for Soda Fabric.